For years, the low-lying plains of the West, especially the areas around Arizona, California, Colorado, Nevada, and New Mexico, suffered from a severe lack of water for the residence, their animals, and for irrigating their farmlands. In fact, it was the hottest, driest region in the United States. With more and more people moving into this area it became quite clear that something had to be done to provide the necessary quantities of water and electric power not only to satisfy the present requirements but also for future generations. 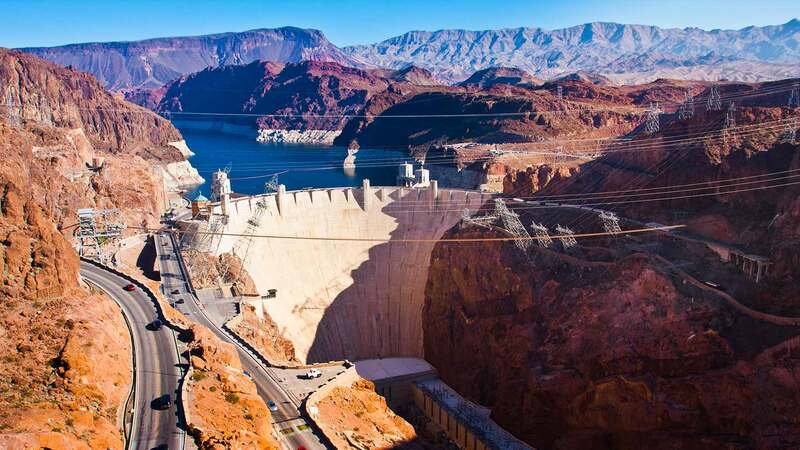 As a result, during the Coolidge administration it was determined that the time had come to harness the enormous power of the Colorado River with the construction of a colossal dam in a project of monumental proportions. Consequently, a commission was formed composed of representatives from the states involved and the federal government who were determined to arrive at an agreement on how the waters of the Colorado and its energy output would be distributed. Representing the United States and the driving force behind the project was the Secretary of Commerce Herbert Hoover who was appointed by President Warren G. Harding in 1921. Meanwhile, as the talks continued, surveys were being conducted by geologists and hydrologists who determined that Boulder Canyon would be a suitable site for the project but later revised their plans and moved the proposed site 8 miles farther downriver to the Black Canyon area. The agreement between the states and the federal government was signed in 1922 but took another six years before the bills authorizing the construction wound its way through Congress and was subsequently signed by President Coolidge in December of 1928. In January 1931, during the administration of Herbert Hoover, now the thirty-first president, Congress released the specifications and their request for bids from private construction companies. Since the business community was still reeling from the effects of the Great Depression many ambitious contractors saw a tremendous opportunity not only to be part of a historic project but also to put people back to work and perhaps to make some money as well. But when the magnitude of the project was examined in detail, many companies found they did not have the financial means or resources to carry out this enormous effort and dropped out of the bidding. Particularly disconcerting was the clause in the contract which required $2 million up front from the winning contractor with an additional $5 million due later. Since these were the depression years, coming up with that kind of money was near impossible, even for the most successful businessman. However, a group of enterprising entrepreneurs found a way to remain in the bidding. To share in the exorbitant scope and cost of the project a consortium of six different companies, each with a unique and necessary expertise, incorporated into the so-called Six Companies, Inc. It was their bid in March of 1931 that won the day over three others. In the months Cost To Build The Hoover Damahead thousands of workers were hired to begin this challenging project with salaries ranging from 50-cents an hour for helpers up to $1.25 an hour for the power shovel operators. And so, in the sweltering heat of Black Canyon the workers and their families arrived, living in tents without proper sanitary conditions, utilities, and clean water. These horrid living conditions continued until Six Companies realized that something had to be done to improve the living standards of their workers. Soon construction was also underway for building Boulder City, complete with electricity, churches, a school, post office, library, newspaper, and stores. After diverting the Colorado River away from the work site through four 4,000 foot tunnels with walls of concrete three feet thick, the work at the base of Hoover Dam began. Power shovels were used to clear away the river-bottom mud which extended down to the bed rock 50 feet below while scalers blasted the canyon walls with jackhammers to make a smooth surface for the dam’s construction. Finally, in June 1933, the first of the concrete for the dam’s base was poured. Over the months ahead, about 4.3 million cubic yards of concrete continued to be poured until the base was 660 feet thick and the dam towered some 726 feet high and 1,244 feet wide. Some 96 workers were killed during the construction, mostly from heat stroke, truck and equipment accidents, slides, drowning, and falls. Despite the commonly held belief, no worker was buried in the concrete of the Hoover Dam. Also included in the project was the construction of four 395-foot water intake towers and the two 230-foot high powerhouse wings which housed the 17 generators. When construction was completed, the diversionary tunnels were closed and the filling of Lake Mead began until it reached a depth of 590 feet. On September 30, 1935, two years ahead of schedule, the Hoover Dam was dedicated by President Franklin D. Roosevelt and the following year the 17 hydroelectric generators were in operation for the first time. Despite the fact that Congress had mandated the name Hoover Dam, Hoover’s Secretary of the Interior, Ray L Wilbur, called it the Boulder Dam after the name of its original site. This mix up in the name instigated years of controversy over what the Dam should be called. Many people, even high ranking government officials continued to call it Boulder Dam while others insisted it was the Hoover Dam. Finally, after years of bickering, the subject was put to rest in 1947 when President Harry S. Truman officially declared it to be the Hoover Dam. Today, water stored in Lake Meade still provides a stable supply for irrigation and domestic usage and, as the water is released through the power plant generators, it turns out 4 billion kilowatt-hours of electricity for California, Nevada, and Arizona. As a result, the Hoover Dam stands as a National Historic Landmark and is listed as one of America’s Seven Modern Civil Engineering Wonders. The total cost to build the Hoover Dam is around $50 million in 1931 dollars and $690 million in 2008 dollars.